In the lush back country of Lloret de Mar you'll find villa Sol i Pins, a wonderful traditional villa built with natural stone and white stucco. Sil i pins means \"sun and pine trees\". That name was chosen for a reason. The area is surrounded with beautiful trees and blooming bushes. Besides a lovely scent, the greens offer plenty of shade and privacy. Your own terrace, with lounging chairs of course, is a great place to sunbathe. You'll take a dive into your own swimming pool. Want to get out of the sun for a bite or a drink? The spacious covered terrace with seating area and barbecue are at your disposal. A wonderful atmosphere! 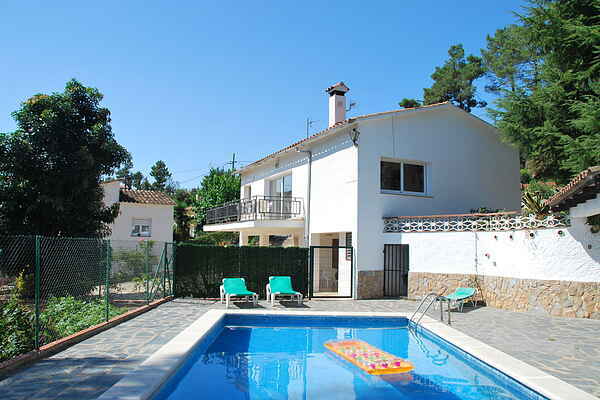 Your villa is located in the Lloret Blau residential area, not far from Lloret de Mar (6 km). You can shop to your heart's content here. You can eat delicious food and drink cocktails in one of the many restaurants, bars and clubs. You'll discover the city center by exploring the typical narrow streets and squares. Right next to the center you'll find the boulevard with its waving palm trees and the beach, of course. If you're looking for some peace and quiet, try the immediate surroundings full of idyllic bays. Visit Playa Canyelles (3 km) or Santa Christina (4 km), for instance.